And many other songs from the B-52's tonight. 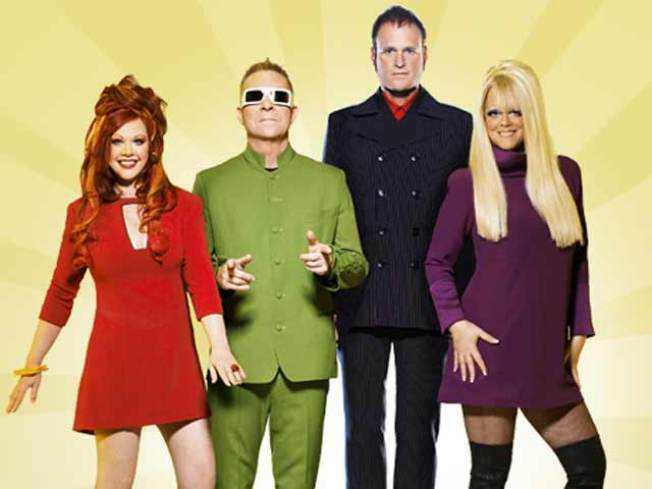 The B-52s play Governors Island. ROCK LOBSTER: It’s just one of the energetic songs you’ll hear from the B-52’s. They are described as a new wave rock band and they are coming to the Del Mar Fairground tonight for the Del Mar Summer Concerts Series. Show starts at 4 p.m. after the last race. The concert is free with track admission or $20 after the last race. Standing room only. KICK IT: Come play Kickball tonight with Secret Squirrel Sports at the Ocean Beach Recreation Center. The focus of this community event is to enjoy the company of those playing the game and to keep it fun. The game is co-ed and open to all skill level. To keep things exciting, they will mix it up by using a big ball for an inning and having a backwards inning. 6-8 p.m. Show up early to warm up. Cost is $5 per person. GALLERY CRAWL: Take a tour to see San Diego Dance Theater dancers perform new site-specific choreography by Jean Isaacs, Jillian Chu, Anthony Diaz and new exhibits at different galleries. Watch dance and art blend at the NTC Promenade in Point Loma. Free.